Groupe Rockabilly Anglais formé en 1978, les Blue Cats se composent de Stef, Carlo Edwards, Clive Osborne et Dave Phillips. 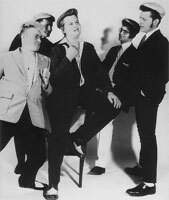 English Rockabilly group formed in 1978, the Blue Cats are composed of Stef, Carlo Edwards, Clive Osborne and Dave Phillips. 1980 SP CHARLY CYS 1072 (UK) I'm Gonna Die / ?